As you ready for a massive tour? I have soooo many Louisa love to share with you. Not only 14 amazing tours participants did their very best to inspire you. I also organised 2 photoshoot days with some of the testers. It’s just so special to see about 10 kids in one place with the same coat. Goosebumps!!! Really! A special feeling. Like the icing on the cake. Just like walking on the street and seeing a girl (or mum) walking around in ons of my ‘designs’. Pure excitement! So I will not keep you waiting. I start with Katrien as she was (together with Linsey) one of the ladies that made this Louisa coat as a hack for my contest last year, I hoped she would want to open this tour. And I’m so glad she did. Her coat looks so straight forward but look at those details. 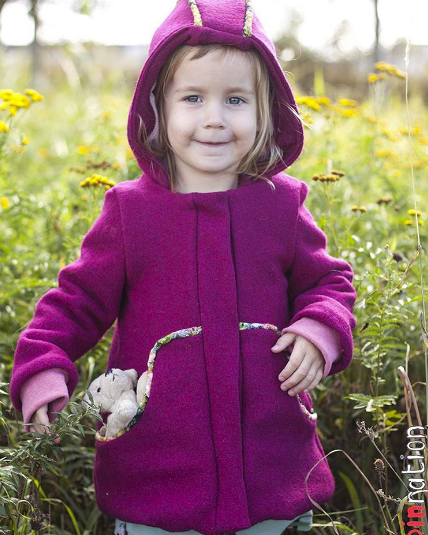 The fabric, the collar, the lining,… I think this coat can be combined with everything in the girl’s closet? ;) I hope so. 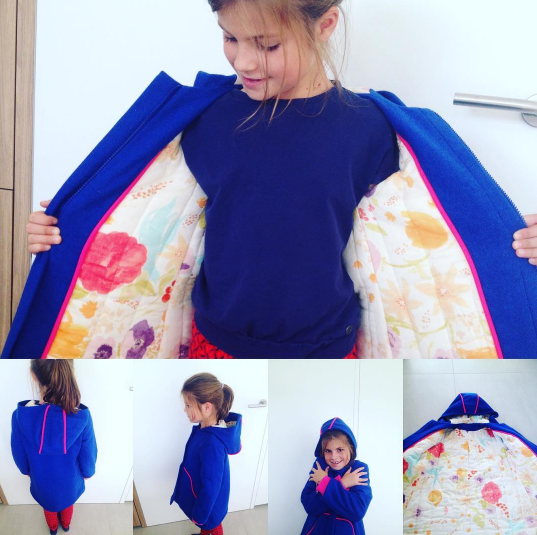 Hop over to Kaatjes naaisels for more details. 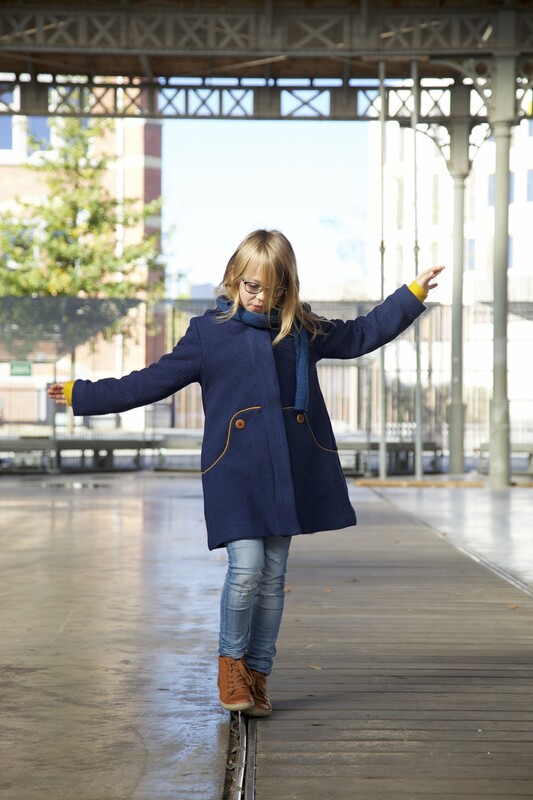 Now it’s time to introduce you to Carolien’s work. Maybe you already follow her blog, but this is the first time that she’s part of the test team and she took her sweet girl Fleur to our first photoshoot day. I got the chance to take pictures of her girl. Such a funny little lady! Nore is so fond of her. When we arrived at the same location for the 2nd photoshoot day, Nore asked: is Fleur coming too? No she wasn’t. :( But I think a playdate might follow soon? But for now: Made By Caro is the place to be! Apart from taking pictures on photoshoot days, I also get the chance to chat with my testers and their girls. Some of the testers have been ‘working for me’ for a long time already. One of those special testers is Karen. 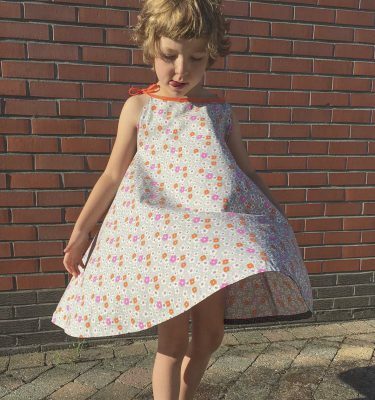 Always smiling, always selecting beautiful fabrics, always enthusiastic… even when her test version turned out a bit too small for her daughter. 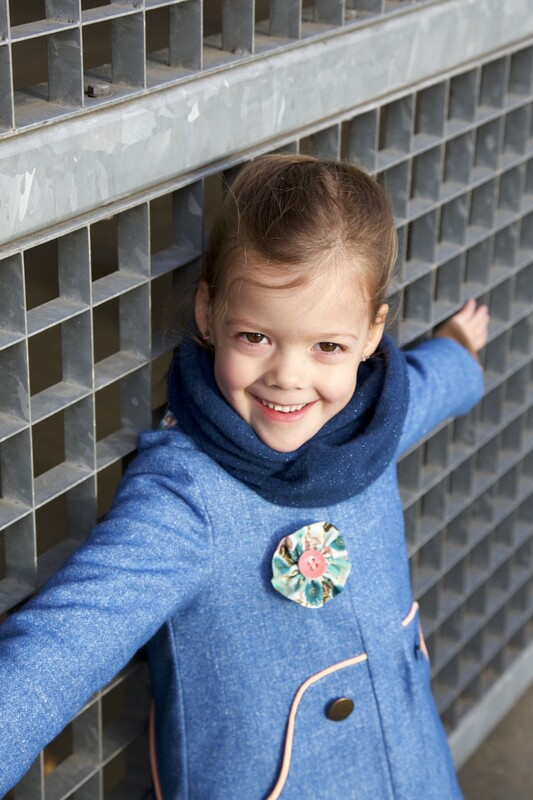 During the photoshoot I got to know her daughter Fien and taking pictures of this cute little girl was piece of cake! She just did what I asked, stood still (Lisa and Nore always move!) and smiled in the most beautiful way. It’s just so strange, but since I follow her blog for a long time already, I had the feeling that I already knew this girl. She wasn’t shy at all. Just cute! Hop over to Magnifieka for more pictures! Thanks for the beautiful introduction, Marte! We had a blast, the day of the shoot! Het was zeer fijn om te mogen testen!